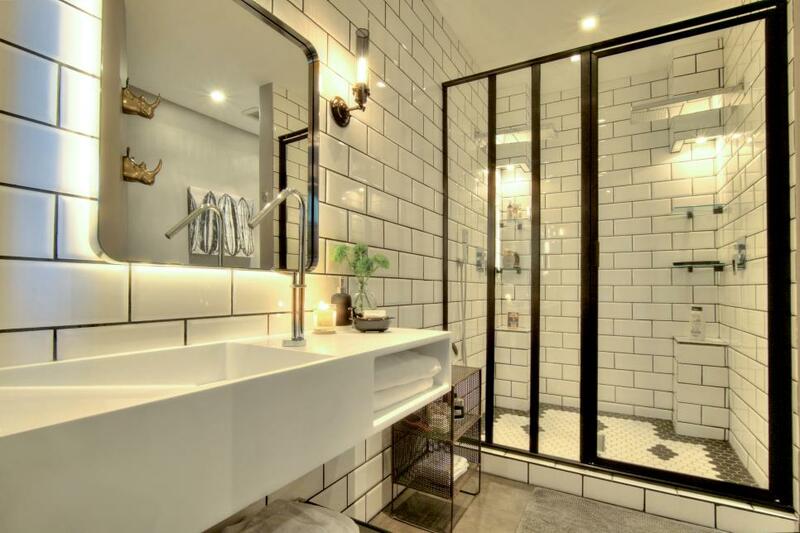 Subway tiles cover the walls of this bathroom, giving an urban feel that's also decidedly fresh thanks to the clean lines and crisp white color scheme. 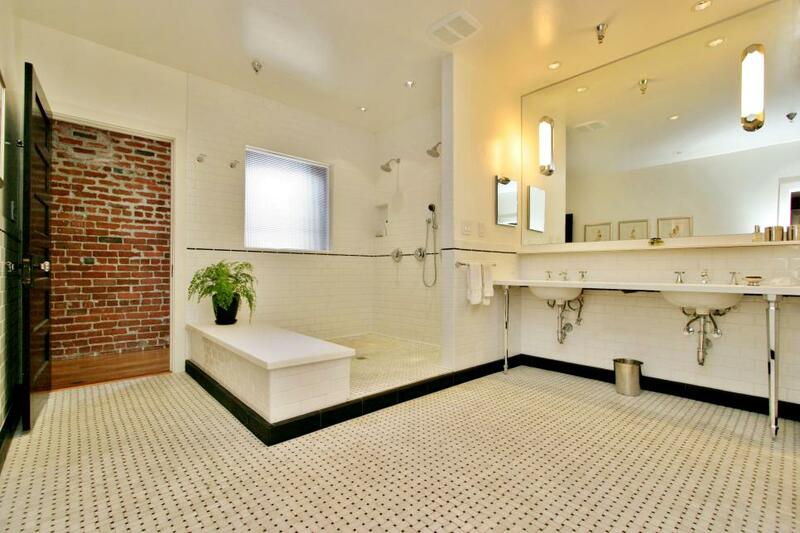 This bathroom is exactly what you might expect in a loft such as this: spacious and without division. 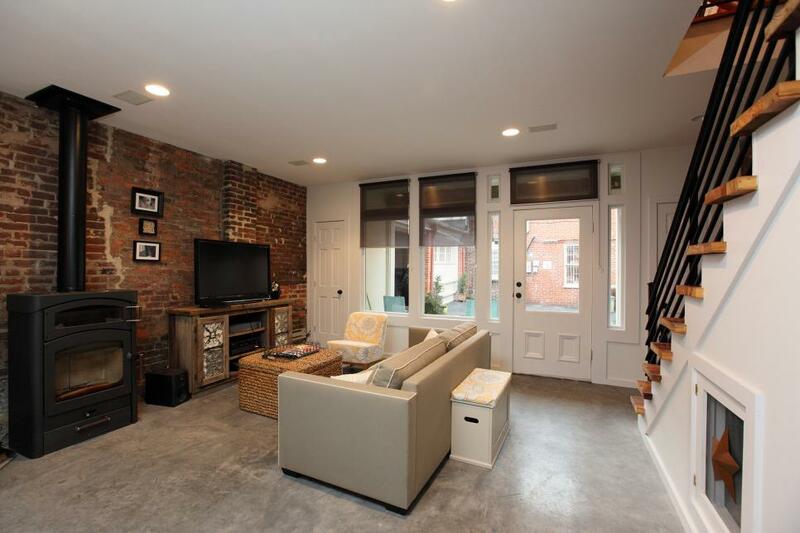 An open shower with a bench, surrounded by subway tiles, is the highlight of the space. A double vanity with a huge mirror promises you'll never fight for mirror space again. The all-white palette assures a fresh, streamlined look. 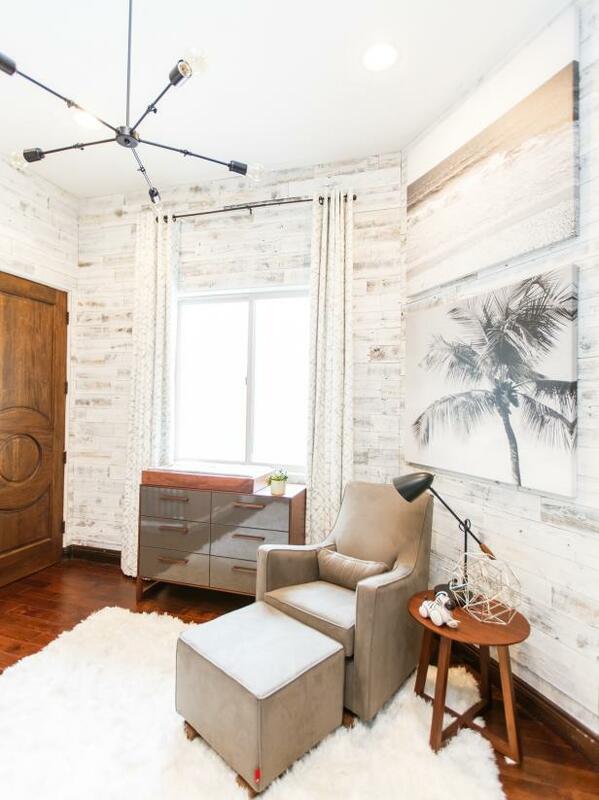 Weathered white planks create a stunning beach-inspired backdrop to this cozy nursery. Light fixtures and a metal changing table nod to industrial style. In order to take advantage of the tall ceilings, large canvases are placed close to the top of the wall and the curtains are hung high above the top of the window. Locally made objects — found and borrowed — tie the entire Spoon and Stable experience together with true Minnesotan collaboration. Stories from the chef’s experiences all over the world were brought into the space with local artists, friends and connections as a celebration of the chef’s Minnesota hometown. 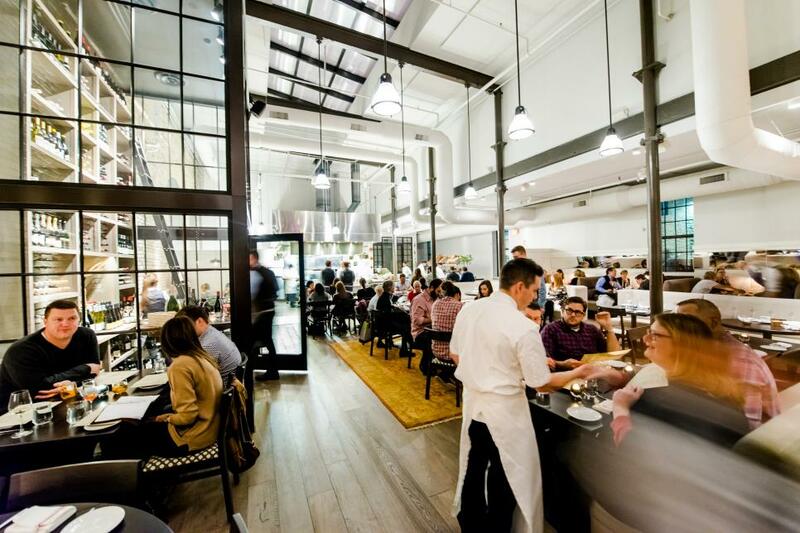 The space is filled with authentic stories made to share around the table in a true chef’s kitchen. 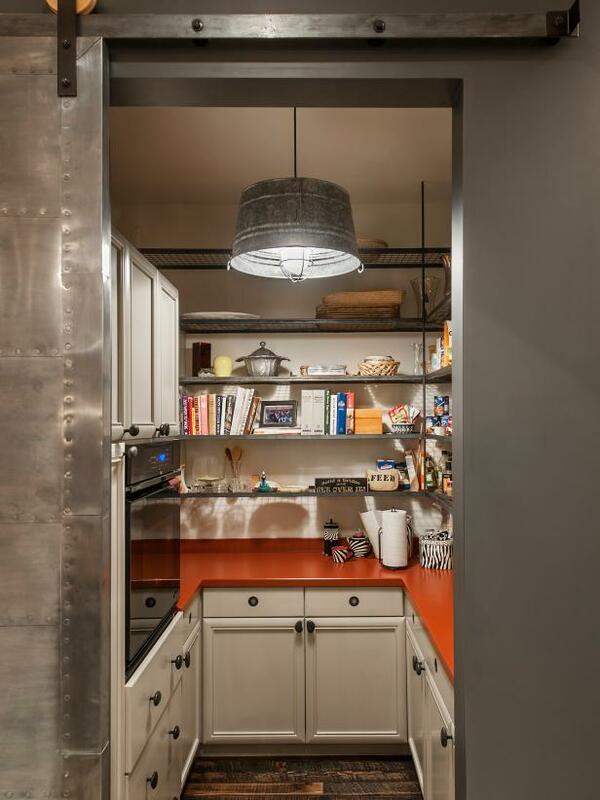 A zinc-clad barn door conceals this walk in pantry when not in use. Shelves made from chicken wire and angle iron allow crumbs fall to the counter instead of being stuck on the shelves, making for easy cleanup. 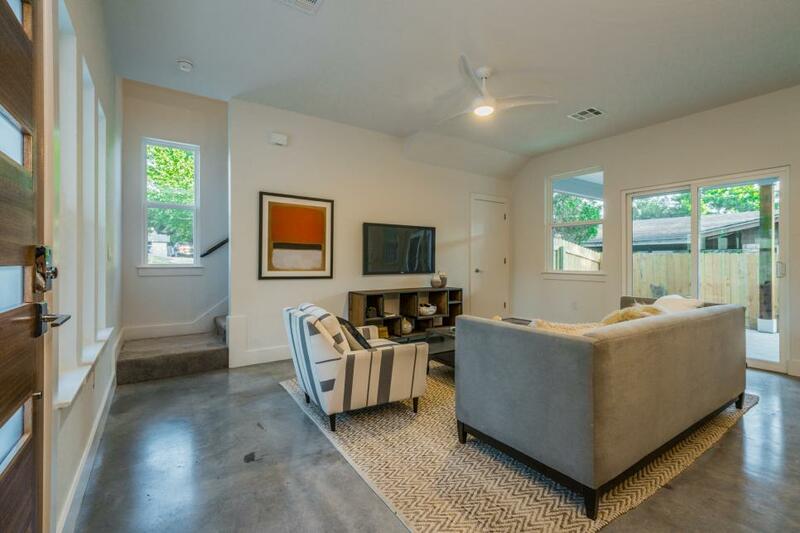 This fresh living room area features neutral furniture, including a gray and white striped armchair, and polished concrete floors, giving it an industrial touch. Sliding glass doors offer natural light, while an orange modern painting adds a pop of color. 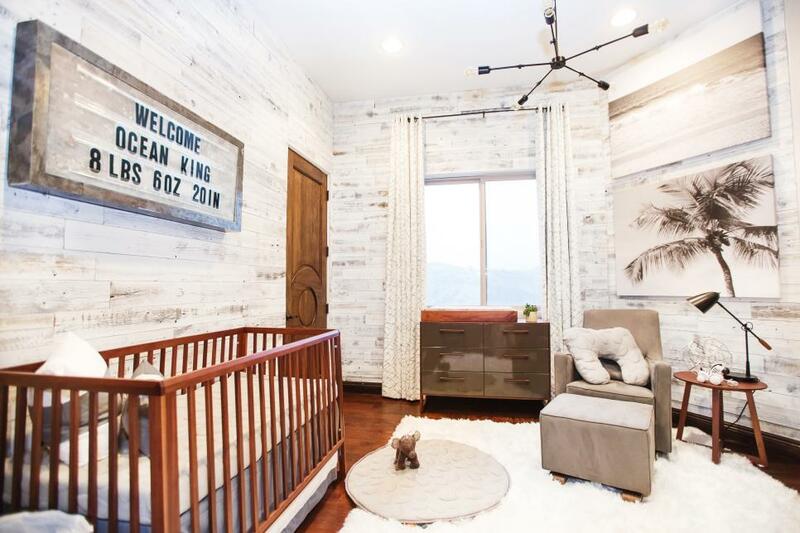 Weathered white planks create a stunning beach-inspired backdrop to this cozy nursery. Light fixtures and a metal changing table nod to industrial style. The marquee sign behind the crib, not only lights up, but the letters can also be changed at any time to write sweet messages or celebrate milestones. 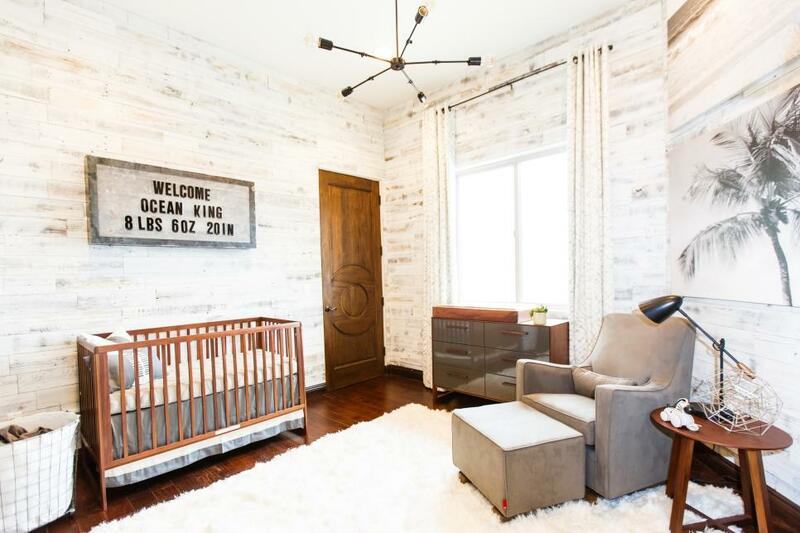 The white shag rug adds cozy texture underfoot in this industrial-meets-beachy nursery. 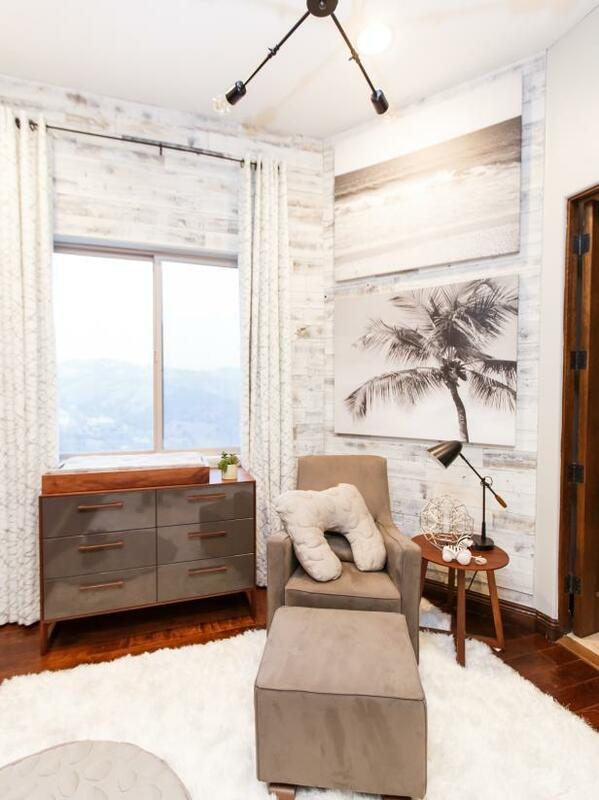 The clean-lined glider pairs with a rustic wood end table, while a contemporary chandelier adds a youthful note. 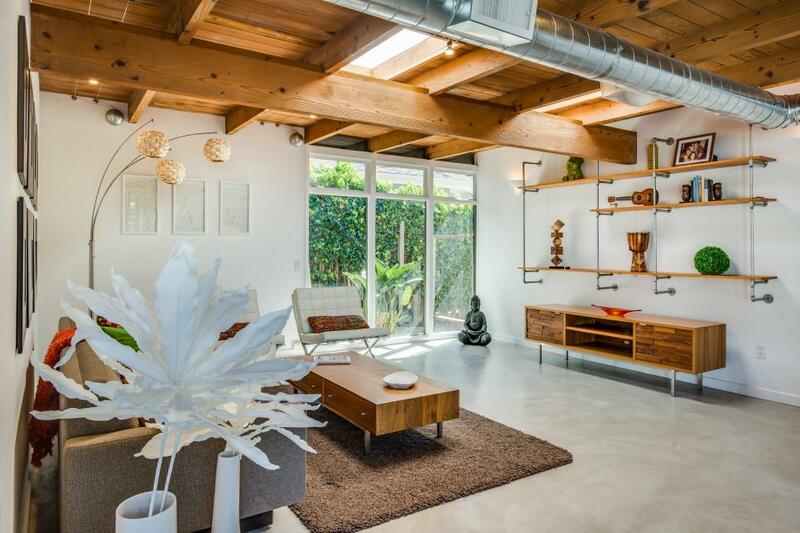 If you love the open flow and exposed structures of loft-style spaces but don’t happen to live in an actual loft, no worries: It’s easy to give any room in any house an industrial edge. In the living room of a midcentury house, for example, designer Michelle Lord left the ceiling beams beams and metal ducting exposed and hung open shelving created from plumbing pipes and reclaimed wood. This studio was designed as a workspace to create original artwork but also to showcase the client's art, artifacts and personal collections. 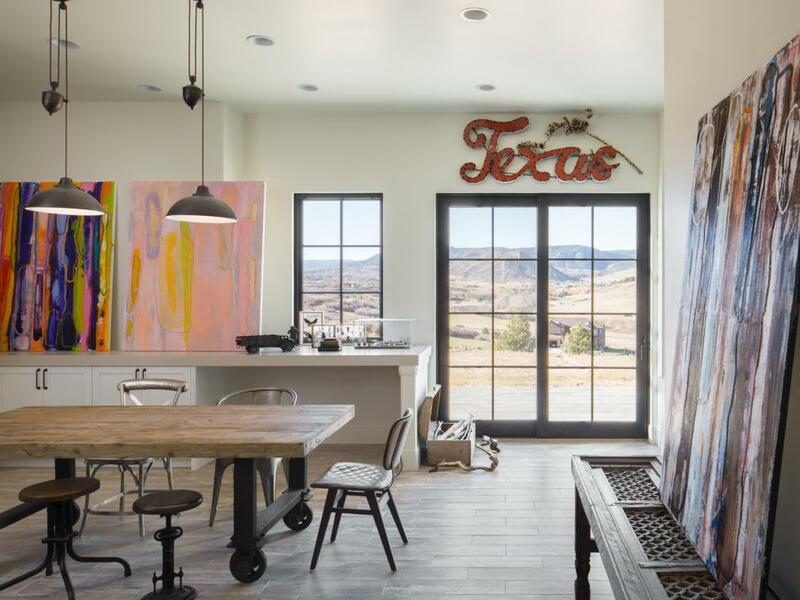 While most of the furnishings in the room feel industrial, the lighted "Texas" sign brings a bit of folk art whimsy to the space. 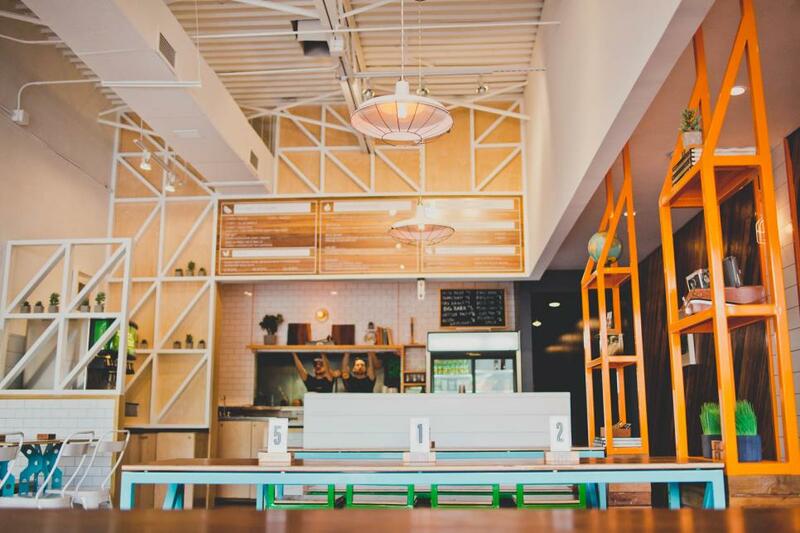 The rugged table and mismatched chairs provides a working surface for multiple people and projects, and pieces of modern art interjects color into the white room. 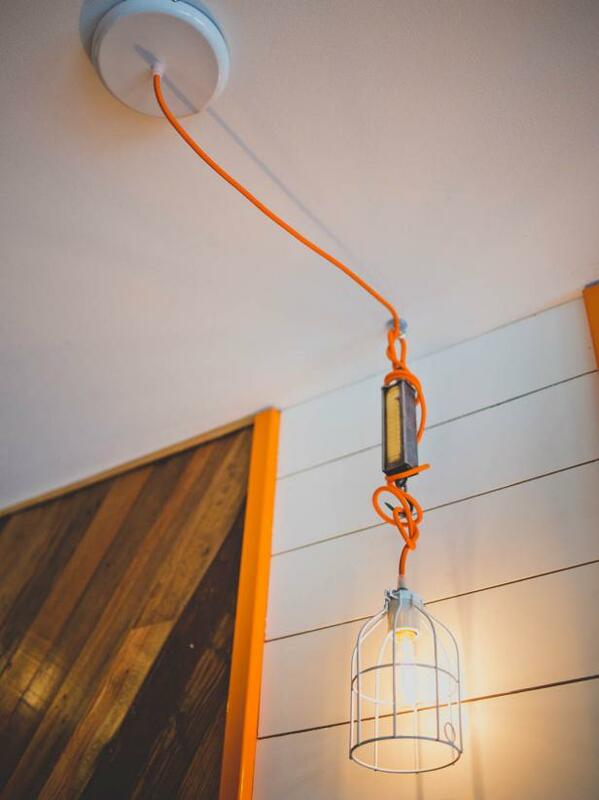 Pendants were DIY with parts from Color Cord Company, and old bank weights were purchased from a flea market to anchor the piece. 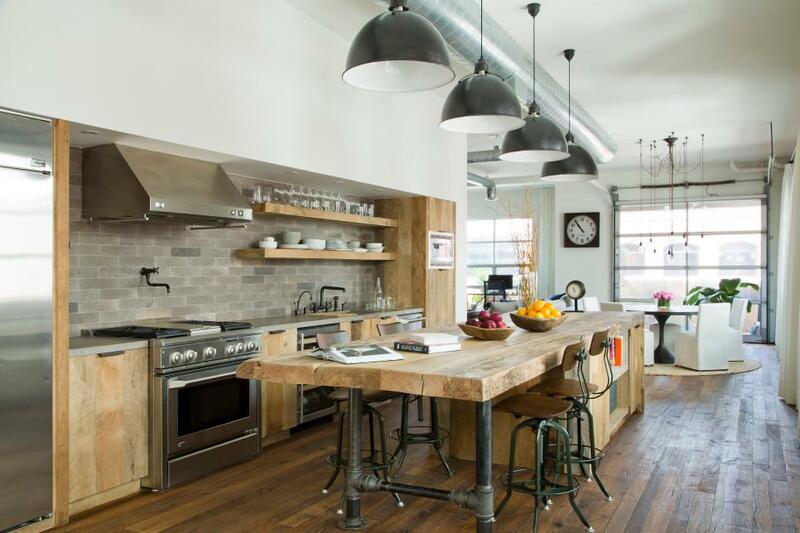 A trio of industrial-style sconces provide task lighting over the kitchen sink and prep area. 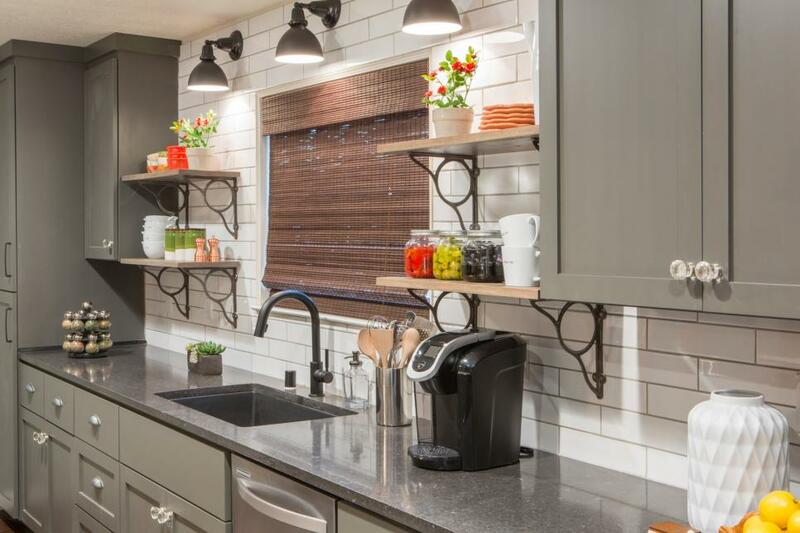 Black quartz countertops top the muted gray cabinets, while white subway tile creates a contrasting backsplash. 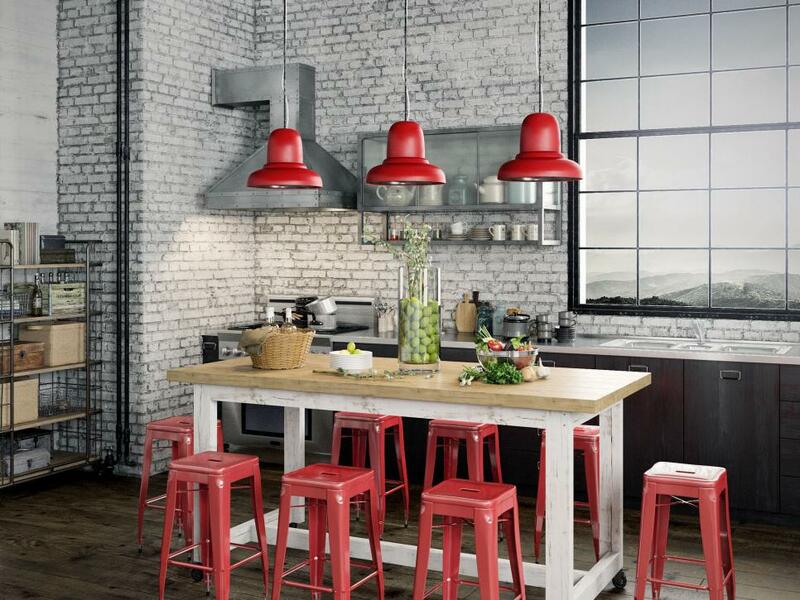 Open shelving with wrought iron brackets keep dishes and mugs handy.